It’s that time of year again – the beginning of tax season! Now that we’ve entered into a new year you are probably asking “when does my employer have to send my w2” for last year? Good Question! Your employer must send your tax form to you by January 31st. If you haven’t been mailed or provided online access to your tax form by this date, visit this IRS publication for more information. Onto the good stuff… What does the information on your W-2 mean? Go through your W-2 line by line using this post as a resource. The information on your Form W-2 is crucial to filing your taxes, so it’s important that you know how to read the form—regardless of whether you’re preparing your own taxes or hiring a tax preparer. 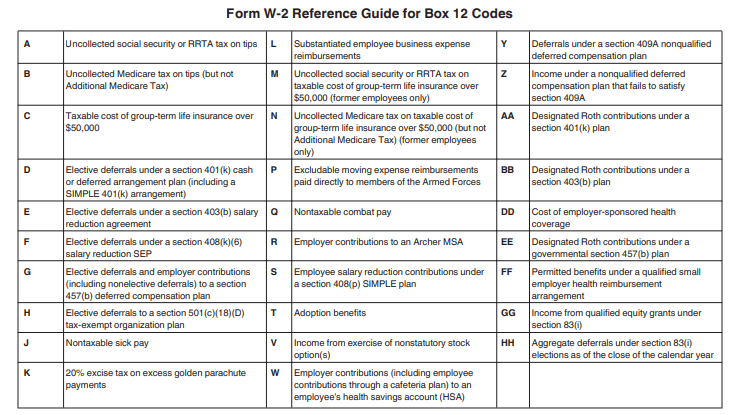 Below is an overview of the boxes found on a W-2. This figure represents your annual wages subject to federal income tax. Wages include hourly compensation, salaries, tips, commissions, bonuses, and taxable fringe benefits. The amount of federal income tax taken out of your wages for the year. Your wages subject to Social Security tax. This amount cannot exceed the annual wage limit for Social Security tax, which is $128,400 for 2018. The total Social Security tax withheld from your wages. For 2018, this amount should not exceed $7,960.80 ($128,400 x 6.2 percent). Your wages subject to Medicare tax. Unlike Social Security tax, there’s no annual wage limit for Medicare tax. The total Medicare tax deducted from your wages. This includes ordinary Medicare tax calculated at 1.45 percent (for 2018) of all wages—and if you’re a high-income earner, an additional Medicare tax of 0.9 percent. If you reported tips to your employer, the total reported amount goes here. The amount stated in this box is also factored into your Box 1 amount. These are tips that your employer attributed to you. (This is separate from the tips you reported.) Go here to see the conditions under which tips must be allocated. A 16-digit code that helps the Internal Revenue Service (IRS) verify the authenticity of your W-2. This is a fairly new initiative by the IRS, so if the code is missing from your W-2, don’t worry, you can still file your return. Your wages, before taxes, used to pay for dependent care expenses under a Section 125 plan. Total taxable payments you got from your employer’s nonqualified deferred compensation plan—such as a retirement plan that allows high-income earners to invest more than the limits offered under a 401(k) plan. Your employer uses this box to provide additional information that can’t go anywhere else on the W-2, such as after-tax retirement contributions, state disability insurance withholding, nontaxable income, and health insurance premiums deducted. The state your employer does business in, and your employer’s state tax identification number. Your total wages subject to state income tax. The total state income tax withheld from your wages. Your total wages subject to local taxes, such as city or school district taxes. The total local taxes withheld from your wages. The name of the locality—that is, the city or town—for which local taxes were withheld. Your employer should give you Copy B of the W-2 to file with your federal tax return; Copy 2 to file with your state, city or local tax return, if applicable; and Copy C to keep for your records. For a more detailed explanation of your W-2, review the IRS’ W-2 instructions or contact your human resources or payroll department. For those looking for online access to your W-2s, visit your My Payentry account and view your information! For instructions on accepting to receive your W-2 electronically, visit our resource page.